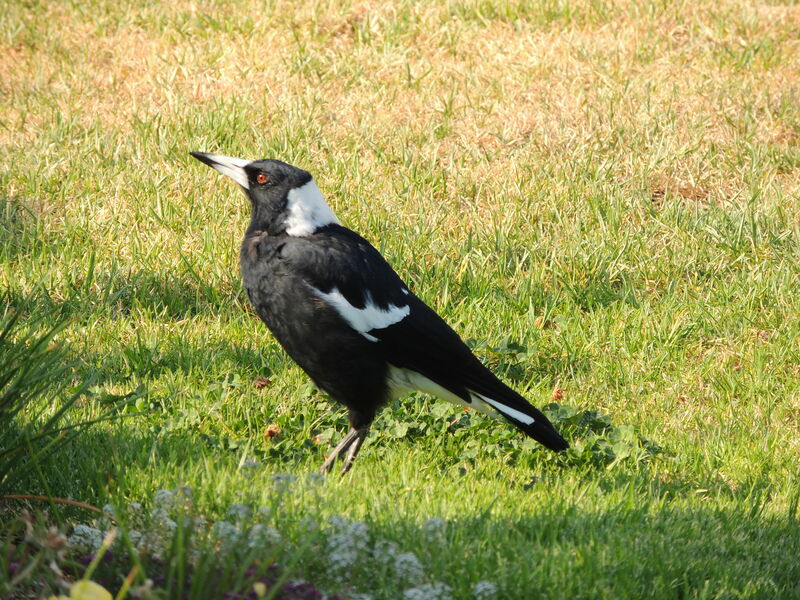 We are very fortunate to have two Australian Magpies as visitors to our garden. 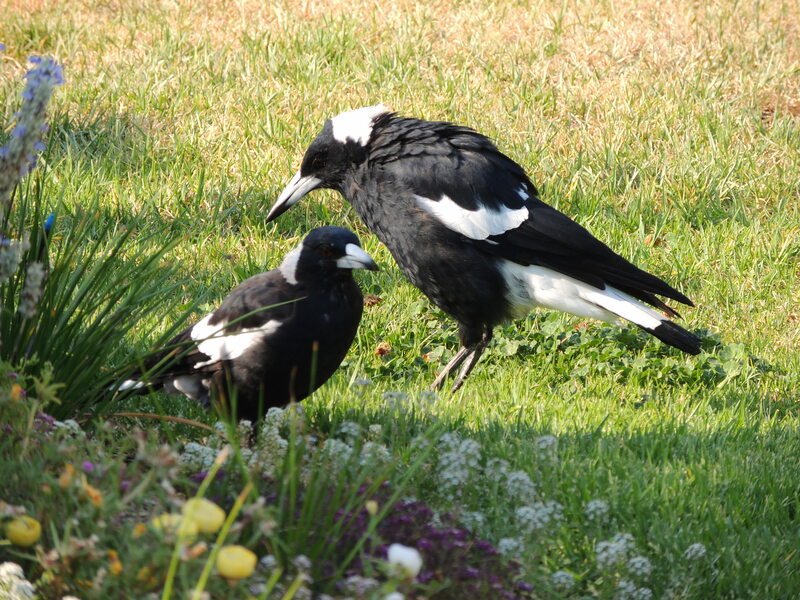 In a recent poll taken by The Guardian (Australia) newspaper, the magpie was voted Australia's most popular bird. This was in spite of the fact that a magpie can swoop on an unsuspecting passer-by and inflict serious damage. To an Australian, the carolling sound of the magpie's call is as evocative as the scent of gum leaves or the sound of breakers crashing onto the beach. 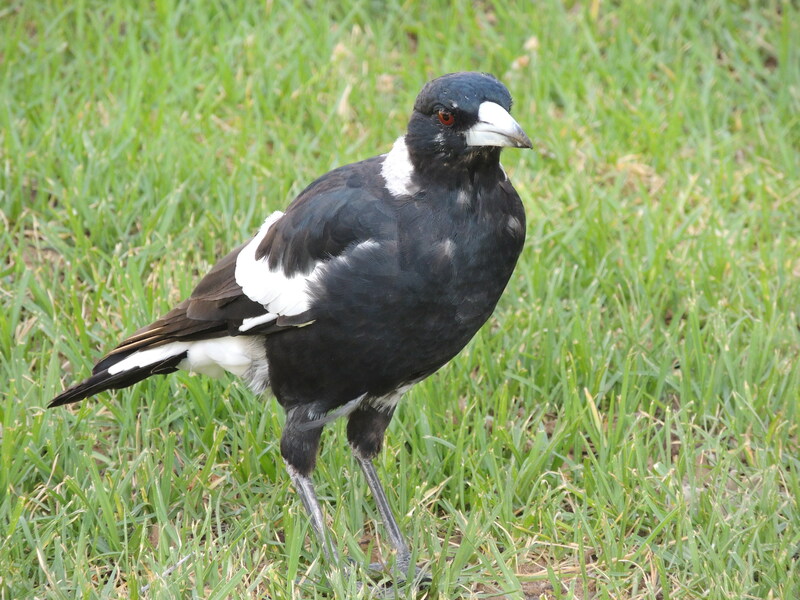 Magpies are found all over Australia, although some people would be surprised to know that their numbers are in decline. The usual suspects seem to be responsible for this sorry state: overuse of pesticides, feral animals, loss of habitat and competition from other aggressive birds. When magpies find a choice piece of real estate, they are quick to make it their home, and it will remain their home for many, many years. It doesn't even have to be a spread: a small garden will do, as long as there are insects and grubs there for the taking. If you also happen to inhabit that place, your new residents will quickly learn to recognise you and will have very little fear of you, allowing you to approach them or feed them. It's true, magpies can swoop upon people who venture into their territory during nesting time, but your tenants should not swoop you, because they know you. Fear of 'swoopage' has led to sights such as cyclists with plastic spikes glued to their helmets, and it was once thought that a plastic ice cream bucket with a pair of eyes painted on the back was also an effective deterrent. I haven't tried this one myself. The ornithologoical name for the magpie is Gymnorhina tibicen. The tibicen part means 'flautist' and refers to the magpie's renowned singing, called carolling. The song is very beautiful, and some people tell of hearing magpies imitate other birds as well. How versatile! I'm looking forward to becoming friendly with our pair. I love to see them in the garden, their heads to one side listening for breakfast in the lawn and to hear them up on the roof warbling in the mornings. It's a very joyous, uplifting sound. Thanks Marg. We should give ours names….or perhaps they’re Claude and Claudia as well! I enjoyed reading about this very special native bird. You know a great deal about your friends! Thanks for dropping in Sue! I am sorry to say I don’t know what magpies sound like. I’ll be listening out for them after reading this. Here is a small sample, susurrus. That one is missing out on a career in musical theatre. Lovely photos of your maggies. Their song is beautiful but for me, the song of the pied butcher bird beats all. Yes, the butcher bird’s call is beautiful..such clear perfect notes. I did vote for the butcher bird in the Guardian poll! Congratulation Jane, now I have publisher amongst my friends. Thanks Christel, glad you liked the post. Jane, I did enjoy reading about your garden visitors, and value your helpful information about encouraging some similar visitors to my garden. Your little story reminded me of one by that famous Welsh poet Dylan Thomas. In that story, A Visit to Grandpa’s, Dylan as a young boy was amused by his grandfather’s efforts to get his ducks to use the new pond he had labouriously constructed for them. He had built a channel from the old pond to the new and beside it erected a sign saying “This way to the new pond”. Alas! much to grandpa’s annoyance, the ducks continued to use the old pond. I wondered if I erected a sign saying something along the lines of “Here is a lovely, quiet garden, where there is always a freshly filled bird bath, plenty of nice fat worms to be found under the pea-straw mulch, other friendly birds (grumpy aggressive types like crows are shooed away) and no sneaky neighbourhood cats” if I might encourage some nice visitors like yours. That’s a lovely story Gillean, thank you. And good luck with attracting birds to your garden. It sounds like bird paradise, really.